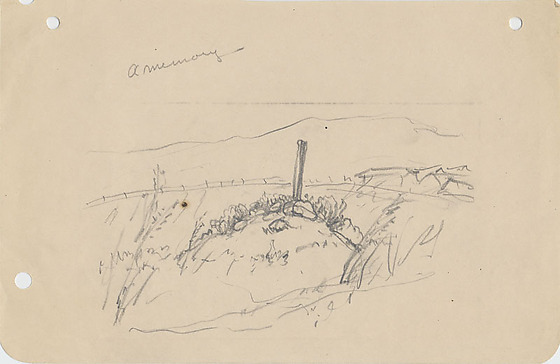 Pencil drawing of a grave with marker in field. Central image is a burial mound covered with stones and grass ; a tall thin vertical grave marker stands on top. Tall grasses grow near base of mound. In the distance a fence is visible across left horizon leading to undefined structures on left. Line in background indicates a mountain. Two holes punched along top ; one hole punched, bottom left ; partial hole punched, top left.